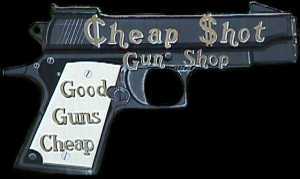 Cheap Shot Gun Shop, NH, New Hampshire no sales tax gun shops, better than the kittery trading post, collectible, collectable guns, military, AK47s, AK-47s, hunting, rifles, where, to, buy, a protection, handgun, machine gun, shotgun, shot, gun, store, no, sales, tax, New Hampshire, Thornton, Campton, Waterville, Valley, waterville valley. The Cheapshot is no more (sigh). Jim is off in the Phillippeans, building boats and air rifles. The gun shop was auctioned off in the summer of 2003. The best of luck to Jim and his company in the PI! E-Mail: edsanders@edsanders.com Copyright 1998, 1999, 2000, 2001, 2002, 2003 by Ed Sanders.